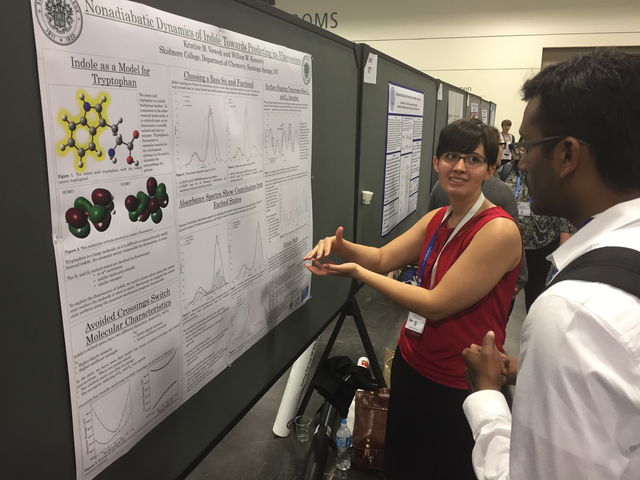 On April 3, 2017, senior chemistry majors Justin Gerard and Kristine Vorwerk traveled to the national American Chemical Society meeting in San Francisco to present their research. They each presented a poster. Kristine presented on her progress using the software package Newton-X developed by the Barbatti group to calculate absorption spectra of indole, as well as calculate surface-hopping trajectories of excited-state indole. 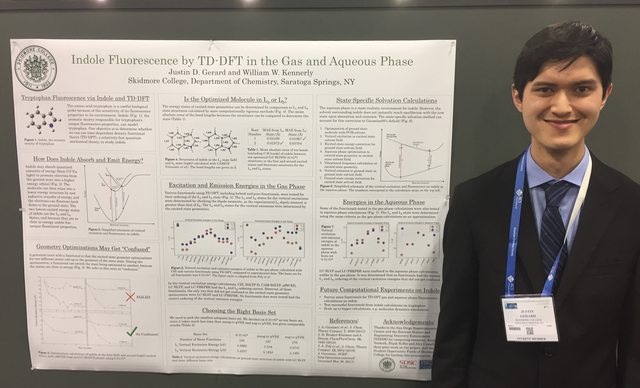 Justin presented his conclusions about appropriate functionals to use for TD-DFT absorption and fluorescence calculations, both in the gas phase and with a state-specific solvation method. Great work Kristine and Justin! Justin Gerard proudly stands by his research poster at the Spring 2017 national ACS meeting in San Francisco. Kristine Vorwerk gesticulates about science while presenting her poster at the Spring 2017 national ACS meeting in San Francisco. We do computational chemistry at Skidmore College. A collection of tips, tricks, triumphs, and failures as we try and figure out how tryptophan reacts with light in biological contexts.